Earlier this year I was on a trip with the family and we hiked to Stewart Falls near the Sundance ski resort in Utah. I had been there many times before with my wife WAY back when we were dating and first married. I remembered how much I enjoyed the waterfall there and was excited to capture the scenery to enjoy later. The hike itself is fairly manageable but I quickly discovered that I am no longer 22 years old. Now I have older legs, way more camera equipment to carry, and 3 kids who all think they need a turn on my shoulders. We finally made it to the waterfall and the pool beneath it. The hike was well worth it. Soon the kids were digging and searching for bugs and playing around the water. This experience was a good one to illustrate that there is a big difference between being a snap shooter and making a photograph. I started shooting initially where I had put all my camera gear down in exhaustion. At first I thought I was getting some good images. I have been working on developing a habit of envisioning the photograph before actually making the photograph. Then I review the image to see if it matches what I had in mind. This habit is a work in progress. Here is the result from my first try. After assessing this I decided to move to a slightly different angle to try to give more depth and intrigue to the image. Though this view was a joy to see in person I didn’t feel like this image captured what I had intended. The image does not have much of interest to it or much to see other than the flow of the water taking the eye in and out of the image. This image to me is a more engaging image that give more to take in and enjoy. There are two elements of composition here. 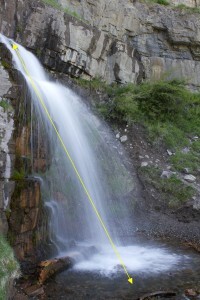 The highlight of the water will draw the viewers eye to the main subject of the image. 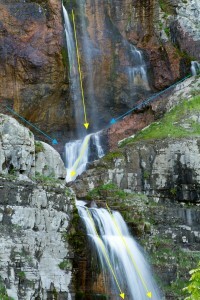 The use of leading lines with the water and the rocks draws the viewer through the image. The movement of the water is another element of composition. I have read and heard from many photographers to always keep in mind why you are taking a photograph and what the photograph is meant to convey. Try to photograph with purpose and go through the exercise of evaluating your work to see if it meets its intended purpose.